Removal of ancient hand carved tower entrance door and screen. The screen was adapted to new dimensions to create a new (and wider) door location to facilitate wheelchair access. Other works on the screen included remaking moulds, dentils, and replacing the areas between the mullions with oak panels. These areas were initially glazed, but needed replacing in light of the fact that the screen is now partitioning off the new WC. The screen was subsequently reinstalled in its’ original position. 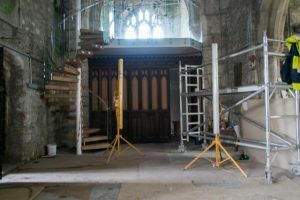 Removal of wooden pews (and returned to the Diocese). Removal of slate flooring (following cataloguing of the location of each piece). 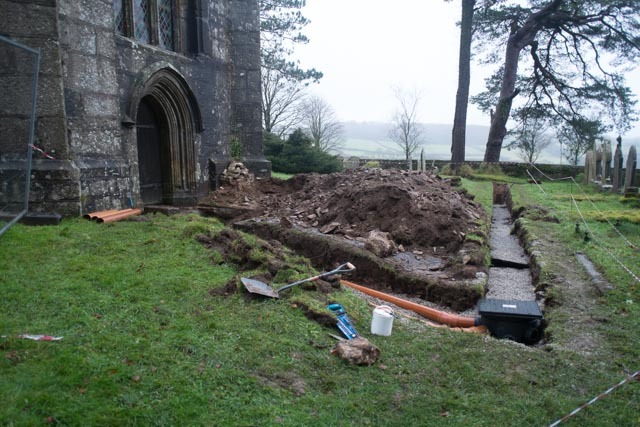 Installation of drainage system for the new WC and kitchen, running from the toilet, through the graveyard to its’ outfall discharge, via a Trench Arch (a traditional environmental drainage system). This was approved by the Department of the Environment, Food & Rural Affairs (DEFRA), as it was the first Trench Arch system to be installed in Devon and Cornwall in recent history. Formation of a module inside the tower for a disabled toilet – using new oak in a traditional frame and steel structure – and full fit-out of the WC. 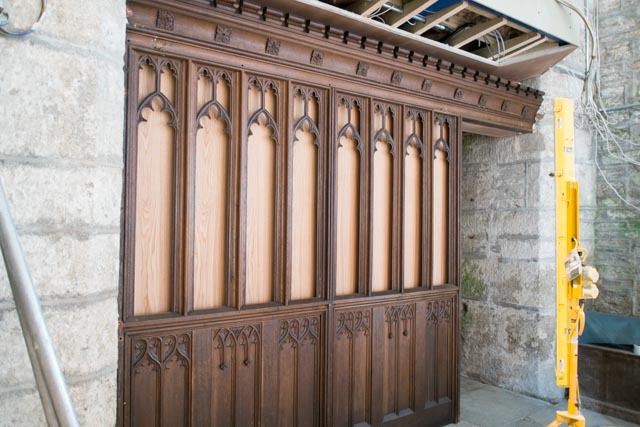 Installation of a new kitchen, a Ryearch contractor design built in solid oak and purpose made – all cupboard doors were hand carved with images of a religious nature. 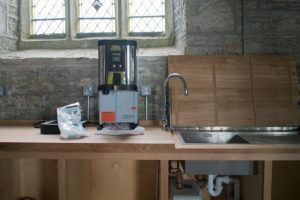 Instant water heaters were hidden within the kitchen structure, and the kitchen was fitted out with Franke stainless steel sinks and taps, ceramic hobs, and refrigeration. Installation of new lighting, electrical circuitry and mechanical engineering, to facilitate the new disabled WC and kitchen. All cabling was concealed. Installation of glazed spiral staircase with new oak treads, to enable bell ringing on an intermediate floor platform. The spiral stairs were Ryearch contractor designed and made locally to the project in Cornwall. All open edges of the staircase had glazed ballustrading with oak handrails to ensure safety. 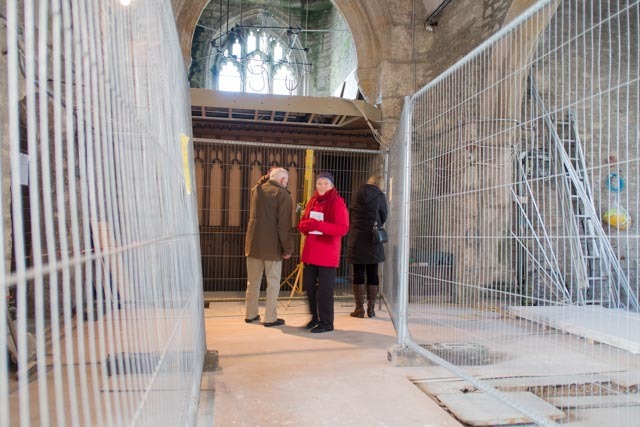 Installation of a huge dividing glass screen (c16m across by c3m high) to the main body of the church. Also a contractor design, the screen included a pair of pivoted glazed entrance doors. 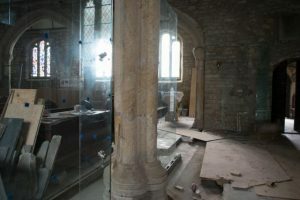 The entire screen and doors were frameless and appear to seamlessly disappear into the church floor. On completion the glazed screen was traditionally shot blasted to depict artists’ impressions along with quotes from scriptures. 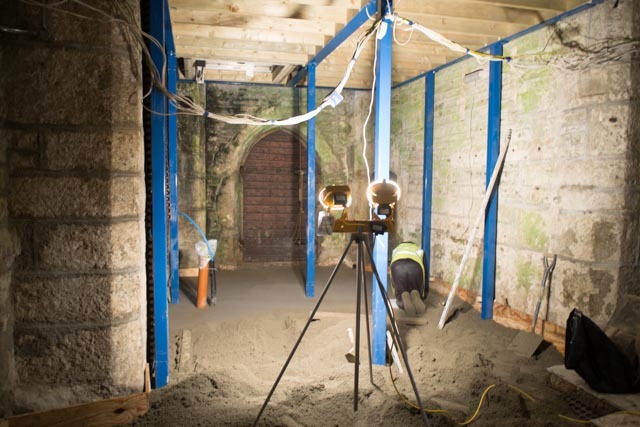 This process eliminated the use of messy sand and was carried out by one of only two countrywide specialists using recirculated molecular material. Re-laying all delabole slates in the exact location of their original positions. The slates were cleaned with conservational products, bedded in lime, sand and cement, and pointed with lime mortar. Lastly, Ryearch made good after digging the trench through the graveyard and other external areas, ensuring they were returned to their original state. All new timber – which included staircase treads, skirtings, architraves and doors – was air dried, aged, seasoned oak, and Forest Stewardship Council (FSC) certified. All existing woodwork was treated and finished with Osma products. An archaeologist was in attendance throughout all excavation works, ensuring that items of interest were noted accordingly. This included the discovery of a large amount of bones, which were subsequently interned. The archaeologist was selected by the Diocese, and was thus novated to Ryearch. 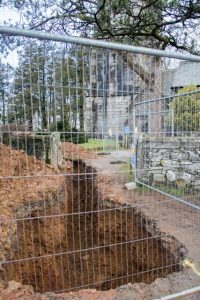 As the church was regularly in use throughout the eight-month scheme, Ryearch prepared the site every Friday in preparation for the weekend worship. This included a thorough site clean-up and installing temporary footways between the external entrance doors and the areas of worship. 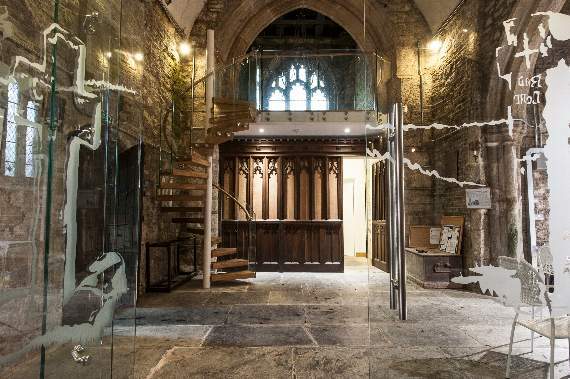 The Church of St Mary project went extremely well with Ryearch’s conservation team getting praise for their high quality of workmanship throughout the refurbishment, including “The builder’s carpenters have done a remarkable job with the old tower screen giving it a new lease of life” and “Ryearch of Plymouth have done a fantastic job on time and on budget.” (West Dartmoor Mission Community) Other compliments and testimonials about Ryearch are detailed here. The refurbishment was completed on time in budget, with no accidents and incidents taking place on the site. The Church was shortlisted as a finalist for the South West Building Excellence Awards 2016 in the categories ‘best public service building’ and ‘best inclusive building’.